Big-time racing returned to Goodwood on Sunday when Chris Newton proved too fast for his breakaway partners in the Oleum-Starlight Grand Prix, the first counting event in the Premier Calendar series. DON'T write off Chris Newton just yet - that was the message from Sunday's opening round of the BCF Premier Calendar, won in impressive style by the Middridge CRT rider from Teesside. Dropped by the Linda McCartney team at the end of last year, Newton is responding in positive style - first winning the North Road Hardriders time trial, and now sprinting to victory in the OleumStarlight Grand Prix. After 92 miles of racing around the Goodwood estate in West Sussex, Newton beat national road champion John Tanner (Pro Vision Planet X) into second place. In third spot was Australia's Ben Brooks, riding for Linda McCartney. Newton, though elated by his win, insisted it wasn't a grudge victory over the five-strong McCartney squad. "It doesn't make any difference to me," he said. "They had their reasons for dropping me from the team and that's fair enough. I'm here to ride my bike, and that's it." Newton was just 10 years old when Goodwood last hosted a big bike race - the 1982 World Championship. Sunday's 9.65-mile circuit used the same roads that saw Guiseppe Saronni take the rainbow jersey from Greg LeMond and Sean Kelly, but in the opposite direction. The Grand Prix, a new event on the calendar, was organised by Rebecca McCauley with some input from husband Gordon, the reigning Premier Calendar champion. And it was McCauley, riding for Equilibrium Essentia Oleum, who lit the blue touch paper with an attack in the opening mile, a passive bunch allowing him to open a gap of 1-50. But after 15 miles the race proper started and the next hour was mayhem as the race split, regrouped and then splintered again under the pressure of continuous attacks. And all the time McCauley was in the front group that grew to a dozen strong before the race came together again with 35 miles covered. 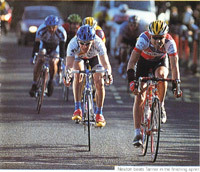 A £100 hill-top prime provoked the next split which saw Adrian Lansley (Helly Hansen) take the cash from a 15-man group. In ones and twos, riders moved across from the main bunch to the break until, with 72 miles covered, a 22-man break pulled clear of a field which had split into five groups. 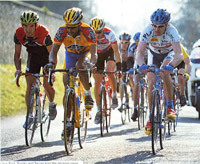 The decisive attack occurred along a short stretch of the A285, as eight riders jumped away from the lead group. In the move were Tanner and his Pro Vision team-mate Wayne Randle, Newton, Brooks, McCauley, Gethin Butler (Preston Wheelers) and Martin Ford (unattached). Up the main prime hill for the eighth time, Newton and Tanner turned up the pressure until only Brooks could stay with them. Over the summit and alongside Goodwood racecourse, the three held a tenuous lead over their four former companions. The pursuit, led by Butler, ended when the leaders were caught on the long descent to Goodwood motor racing circuit, and at the bell the seven were together again. It was an evenly matched group and the only place anyone could gain an advantage was on the last prime climb. Brooks was first to attack on the climb, but Ford chased him down. Then Tanner hit the front but was too closely marked by Brooks. Newton accelerated and it all proved too much for Randle and Butler, who lost contact. In a repeat of the previous lap's pattern, the dropped riders fought their way back into contention on the long descent, setting up a seven-man sprint for the finish in Claypit Lane. Butler was first round the lefthander into the finishing straight. But it was only a token effort by the non-sprinter and it was Newton who led the charge for the line to clinch a first prize of £250. Just under a minute later, Aaron McCaffrey (Heff's Bike Shop) took a four-up sprint from Rowan Horner (VC St Raphael) to finish best of the rest. ITS a long way from Middlesbrough to Goodwood but the trip paid off for race winner Chris Newton, who is seeking sponsorship after spending the last two seasons with big teams. "My equipment is provided and I get my travelling expenses, but I still need a backer to make it worthwhile," he said. "I'm getting to the front and winning races - there isn't much else that I can do." Newton admitted he was 'playing catch-up' for the first half of the race but finally hit the front on the hill prime. "It was a deceptive climb - first time up I thought, `there's no way it's going to split on this,' but although it's a big-ring climb it's a hard one. "I had a little dig on the last climb but nothing happened, so I thought I'd try and keep it together for the final sprint. Pro Vision had to do most of the chasing because they had two riders, so I used them a bit. I knew the course from the Surrey League five-day, and I checked out the finish during my warm-up before the start and knew that I'd have to be first or second coming into the last corner." Runner-up John Tanner said: "It was a wearing-down process. There were so many people sitting on in the early stages, you'd get in a break and no one knew what to do. It worked out all right in the end, the climb just got harder and harder with every lap. In the sprint I got boxed in early on. left it a bit late, but Chris was fast and he deserved to win it." Australian Ben Brooks , owner of the most tanned legs in the peloton, used the event to keep in shape while the rest of the Linda McCartney squad was riding Tirreno-Adriatico. "I was going pretty comfy all day and with a kilometre to go thought I had the legs to win it in the sprint, but Chris was too fast," he said. Wayne Randle was dropped on the final climb but fought his way back to finish fourth. "Nobody was really committed, there's always a chance of getting back on once you're over the top of the hill," he said. "Then I tried a couple of attacks on the run-in - you only need gain a couple of seconds and you've got it." 20. D. Axford (Real Cost Car Imports) st.